We recognize that purchasing land and building a home is perhaps one of the most important and difficult investments most of us make in our lifetime. Just finishing our own barn home for ourselves, we realize how many decisions have to be made on an ongoing basis and how each choice sets the stage for the next one. In most cases there is no going back to change the fundamental choices you make from the very beginning of the process. 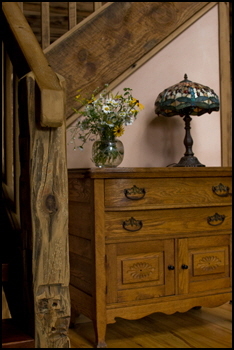 In the case of choosing to secure a historic barn frame and converting it into a home, your first major decisions, and the ones that will perhaps have the most profound influence on the finished product, will be the barn frame you select and the people you choose to help you design and build it. With these thoughts in mind, we have invested a lot of time and energy here to include some extensive information about these issues. Hopefully this will help educate you and enable you to make more informed and intelligent choices about these matters. One of the most confusing areas for many of our clients has been the wide range of prices they find on the internet for barn frames and they seem to always be billed as "excellent frames". Well, in truth, what you pay for the barn frame initially is not the only costs you will incur with this frame when it is all said and done. And one step further, some frames are vastly more "excellent" than others, particularly for home conversion purposes (see “What Makes a Good Barn Frame”). Of course, part of this confusion stems from one of my father's favorite sayings - "A fish salesman never yells stale fish". But I think some of it also simply stems from lack of experience and knowledge of barns and the barn to home business by many newcomers into this arena over the last several years. Many barns are sold very cheap ''as is". By the time you do the repairs and replacement parts, structural and engineering changes to meet code, adaptations to make the frame work as a home, you may well spend more money than you spent on the barn initially. And then, perhaps even more important-- if the barn frame itself is really a spectacular one and if it lays out in such a way as to ease itself cost effectively and charmingly into a home. On the other end of the spectrum, I think some of the very high priced barns you see on the net coming from some companies that I do consider reputable, seem to me to just be "pricey". 1. Our costs to purchase the barn standing, dismantling costs including clean-up, repairs necessary, and shipping costs to our shop. 2. 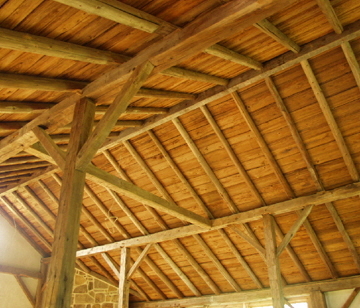 Overall size of frame, timber configuration, size of timbers, condition, special features like swing beams, and other characteristics that we detail in the section of "What Makes a Good Barn Frame". Spectacular barn frames are much harder to find and secure and more in demand, and consequently cost more than some of our frames that we would consider in the good to average range. 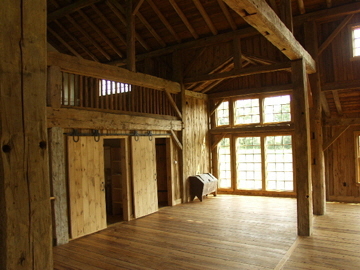 For barn home conversions we particularly encourage our clients to only settle for a spectacular frame. If it doesn't have at least 10"x10" posts, for example, we would probably not consider it a spectacular frame. Many times our great frames we sell for homes have 12"x12" or even larger posts. 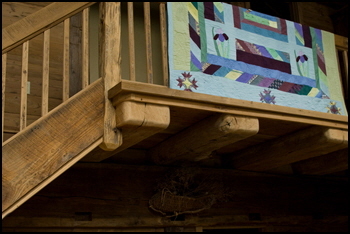 Generally if the posts are large, the rest of the barn timbers are large, too. Size of timbers definitely matters in the barn frame business. They cost a little more, but for what you get it is money well spent in the overall scheme of the barn conversion and for the enormous additional appeal and character they add to your finished home. The price of our frames includes all the upper posts and beams, girts, knee braces, rafter plates, purlin system (if it has one) and rafters. The frame is photographed, measured and a scaled drawing is done showing each timber with all relevant measurements documented. Every piece of the frame including rafters are then tagged for reconstruction and then the barn is carefully dismantled. This package price does not include the undercarriage (floor joist), if the barn has one, or siding, flooring, roof boards or other miscellaneous lumbers from the barn. However, we can provide those lumbers for your barn project and you will get a 20% discount off our web page prices at the time you purchase the barn. The frame is then brought back to our shop for all repairs and/or replacement parts, which we do skillfully with like materials so that the structure of the barn is maintained as well as the appearance. As much as possible we like to repair the damaged piece to maintain the integrity of the barn frame. We are very particular about how much damage, replacement parts etc that a barn can have if we are purchasing it for reconstruction. The less repairs the better for everybody. We then power wash the frame and prepare it for storage or shipping. We rarely do insect spraying as we have never run into any serious insect problems in our work over the years. I did not spray my own barn frame. However, we can have it done for an additional reasonable fee if requested. Shipping of the frame and materials to your site will vary based on how far it has to be shipped. Generally speaking, most frames require a tractor trailer. Currently the shipping costs to the East Coast - say NY City - would run approximately $2,000.00 or so. Shipping to the West Coast might run approximately 6000-7000 dollars. Shipping charges change frequently with the price of fuel. To save you money, we usually suggest that you arrange to have the frame unloaded at your site by your general contractor. We suggest that the frame comes to your site after your excavation, construction road and perhaps even the foundation and deck are installed so that there is no problem getting the truck in and you can store the frame reasonably close to the building site. Many times your contractor will already have equipment there that would be adequate to unload the frame. If we are reconstructing the frame and everybody's timing and schedules would just happen to work out perfect - which is usually rare - we could also come to your site and unload the truck and start the reconstruction of the frame all at the same time. If you purchase a frame from us, we recommend that you also contract with us to reconstruct the frame. It just makes sense. Click here for more information about our reconstruction fees and what we offer. Many times we sell our barn frames before we get them listed on our web page and this is a good way to get a really great barn. Call us and talk with me about your needs and I will help you determine approximately what size-range frame might suit your project building plans. We will then e-mail you pictures of any barns we get that are within that range and give you an opportunity to discuss the possibility of purchasing it before we list it on our web page. Really great frames often don't last long on our web site and we generally sell only a limited number per year. The really spectacular ones are not that easy to find.